I am never surprised when the question gets asked for the millionth time about whether one should look for a boat with a single engine or twin engines. It is one of the most basic questions about a perceived issue in the world of power cruising. Whether one is considering a traditional trawler or some other type of cruising powerboat, this inevitably comes up. I can’t recall a boat show or PMM issue where this didn’t surface in one way or another. Given the way our market and community matured from the mid-’90s, it seemed everyone had an opinion and could argue with some degree of certainty that they were correct. The reality is a bit vague, and for good reason. Bob Lane once conducted an experiment with two Grand Banks classic trawlers, identical except that one had a single diesel with bow thruster and the other had twin engines. At the time, the difference in cost of single vs twin engines in a GB was about $40,000. The event had a number of participants, some with little knowledge, others will experience in one or the other, or both. One blustery day on the waters of Puget Sound, each person took turns maneuvering the boats to see which proved better at close quarter work. The results, not surprisingly, proved that a single engine boat with a bow thruster could do everything that a twin engine boat could do, whether docking, backing down a fairway, or coming close enough to a float to test each boat’s ability to stay under complete control, even with inexperienced skippers. Some people involved in the test expressed a fondness for one or the other, but there was no clear winner other than proving each does the job. Access to the engine on this Krogen 44 is outstanding, something quite appealing to a new boat owner. The extra cost of a second engine, and associated expense of maintenance and fuel, would push me to consider a single engine if I bought a new boat fresh from a builder. We used to say that if a new diesel engine is going to experience a catastrophic failure, it will almost always happen in the first 100 hours. That was proven true over and over. On the other hand, Tad Roberts wrote a piece where he argued that a twin-engine setup allows for shallower draft, and having two engines provide the get-home ability, as well as reducing the need for a third engine to generate electricity. Overall, he reasoned that these two engines could reduce the weight and cost of onboard systems, a design goal he likes to pursue. 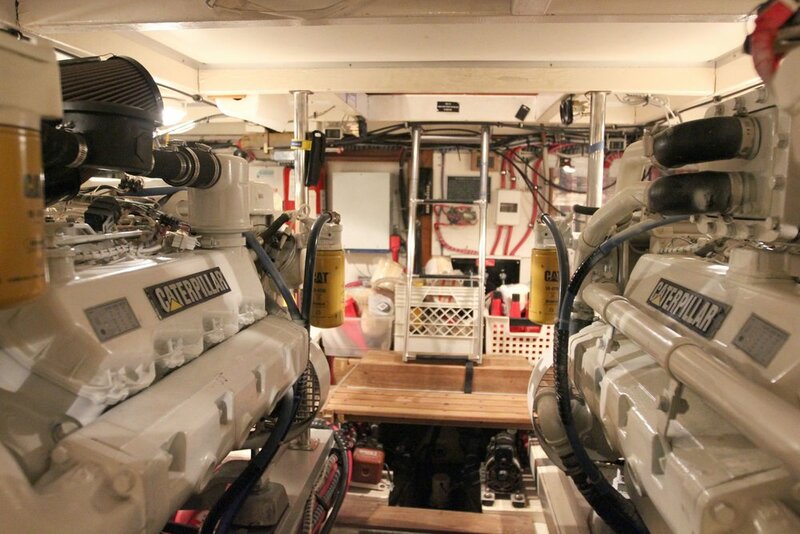 With all this spinning around in my head, as I look for my next cruising powerboat, I agree with broker Jeff Merrill that how many engines a boat has is not the critical element that it once was. And as 93 percent of diesel engine problems are fuel related, the get home issue seems mute to me if both engines are fed by the same fuel delivery system. I’ve owned both and except for the issue of potentially higher speed with twin engines, my preference is for whichever boat provides the best accessibility for my aging self. None of this should be new to any reader of PassageMaker, because we addressed this many, many times. However, there is a new factor not fully considered before. And I believe it truly changes the discussion. All of the shiny boats we toured over the years were new. A tug or trawler or power cruising boat that was new in 2000 is getting mature in 2018, and there is no telling about the varying stages of its maintenance and care. Even more important is what I see on the trawler and cruising forums and social media groups. It seems the majority of people asking the basic questions while boat shopping are looking at much older boats, built in the 1970s and ‘80s. And that changes my attitude completely. I think one who considers buying a cruising boat that is 30 or 40 years old should probably lean towards twin engines. It is pretty hard to accurately and positively evaluate engines that have had numerous owners, with potential engine and related machinery service across the board. Bob Smith used to say that with an older boat, whether it had one or two of his Lehmans or some other brand, it was a smart idea when buying an older boat to have your service tech round up the engine hours to the next major service interval and do all scheduled replacements of parts and service. That is still excellent advice. Of course, with newer electronic engines, the ability to see precisely what happened during an engine’s life takes out much of the unknown. With a laptop, a service technician will see when it overheated or spent much time at WOT or whatever. On older boats, there is no such luxury. Of course, just because an engine is older doesn’t mean it is near death, but it does increase the chances of problems or issues while cruising, so having two engines is a decidedly more comfortable and reassuring situation. Heat exchangers, exhaust elbows, valves, springs, bolts, camshafts, bearings and other pieces of machinery do fatigue and wear out, and sometimes there is not much warning when something lets go. A transmission refuses to go into gear, then what? The desks of most boat yard managers have plenty of evidence of cracked and broken parts. How many times have I seen cracked pistons become ashtrays? Too many to count, although they probably came from gas engines. And it doesn’t stop with the diesel engines. Look around any engine room. Hidden crevice corrosion of a prop shaft has been known to break a shaft or cause a prop to fall off (it’s happened), exhaust system hoses and components, transmissions, pinhole leaks in cooling systems that spray saltwater onto alternators and electrical components, rusting engine mounts and other mounting hardware… A complicated engine room takes on a new dimension with each passing decade. So while I remain a fan of single engines for the most part, if I were considering a vintage Hatteras LRC, Ocean Alexander, Grand Banks, or any number of Taiwan trawlers, I think I would feel better with twins, as long as access was still good. Years ago, I fell in love with a new Grand Banks Europa that I want to recall had a single John Deere engine (it might have been a Cat or Cummins) that Ed Roberts showed me at one of the East Coast shows. The engine had superb access and it was such an open clean engine space. Today that boat would be close to 20 years old. Probably with no more than 5,000 hours on the engine, but what kind of hours were they and how well was it cared for? 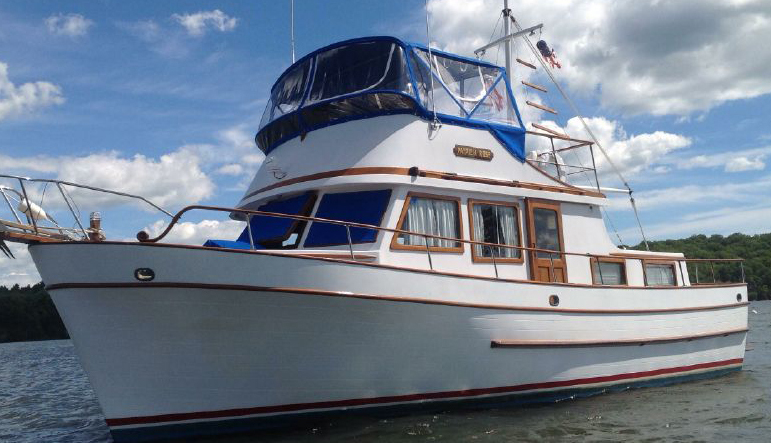 When the Flanders sold their Nordhavn 46, the single Lugger diesel had 16,000 hours on it. And the engine surveyed perfectly. Diesel engines last a long time. Commercial guys work their engines much harder and longer than we do, and they put tens of thousands of hours on them between rebuilds. But unless that is part of your plan when buying a new-to-you boat, you will most likely be cruising with what you have. After 20+ years of this discussion, I know the subject is not going away, especially as new people come into this community. But when it comes to older cruising boats, it has me thinking with a new perspective. Newer PostMonday Minute - What's In Your Dinghy?